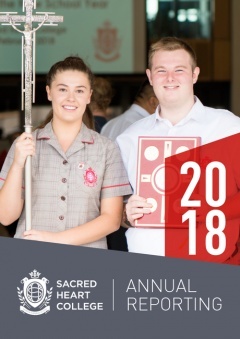 Sacred Heart College is a Catholic co-educational secondary College from Years 7 to 12 with an enrolment of 1418 students. The College was established in 1967 by the Sisters of Our Lady of the Missions but its history can be traced back to 1898 when Sacred Heart School opened in the central Perth suburb of Highgate. The College motto is 'Always Striving Upwards'. The curriculum is based on Christian values and offers a wide range of quality educational opportunities that foster the Spiritual, Academic, Cultural and Sporting development of students. There is a strong university focus as well as an extensive vocational education program. A Special Education Centre caters for students with special learning needs. Central to the curriculum is the philosophy of creating lifelong learners who use their potential and talents in the service of others, and for the benefit of themselves. The College recognises the value of parents and supports them on their role as the prime educators of their children. A highly successful extracurricular program is offered to students. This enhances the excellent Spiritual, Academic, Cultural and Sporting achievements of the college, making enrolment a highly sought after option for families in the community.